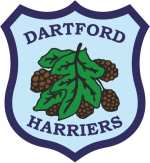 Dartford Harriers Athletic Club was established in 1922 and is based in Central Park Athletics Arena. We are a very friendly club that caters for all ages and abilities, with the aim to inspire, promote and coach athletes to their full potential. We hope our website provides you with access to the information you require, however, if you do require anything else please do contact us. Alternatively, you can follow us on Facebook.